Back by popular demand I have created more Ravens Bingo cards. I had so much fun playing Ravens Bingo for the playoff games and the Superbowl I thought I would to start off the news season with more Bingo. I only made positive Ravens Bingo cards because after all I am a Ravens fan and just did Ravens party segments on WBAL this morning. The Bingo cards add another level of excitement to the game while cheering for our team. If they do well, you get to add a marker on your Ravens Bingo card. After you print the cards, cut card stock to matte the bingo cards to give them the team colors. I used bottle caps painted purple and black as the markers. I used a Bingo card generator found at www.bingocardcreator.com. Enjoy you the first Ravens home game…GO RAVENS!!!!!! 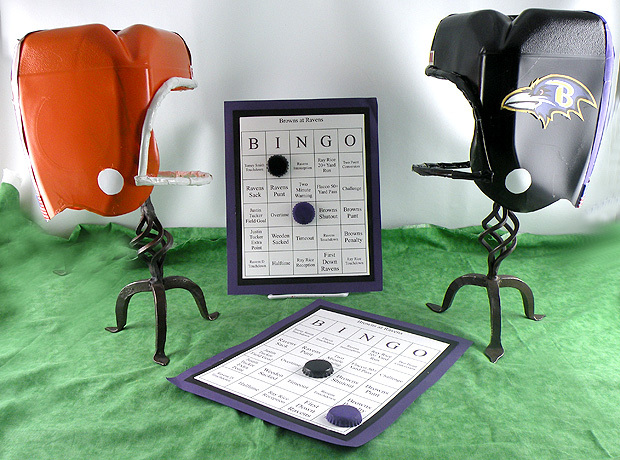 This entry was posted in Crafts, gina tepper, Recycle, reuse and tagged bingo, bingo markers, bottle cap bingo markers, Football, Gina Tepper, Ravens Bingo, Ravens Football. Bookmark the permalink. I tell it like it is, and I wish I looked like you!